Atlantic Canada's first Tattoo Studio to be Accredited by the Better Business Bureau. "A Cheap Tattoo isn't Good - A Good Tattoo isn't Cheap"
At Sin on Skin, we're always looking for another experienced artist to join and complete our busy team. If you're that artist and want to find a studio that will help you grow and reach your goals, stop by and speak to us anytime. If you're too far away to stop by, please feel free to email off your resume and portfolio for consideration. Received the 2019 Award of Excellence from Three Best Rated. 2018 Flare Magazine - Best Tattoo Parlours in Canada List. 2017 "Local Book Choice Community Award" presented by Yocale. Received the 2018 and 2017 "Award of Excellence" from "Three Best Rated"
Listed as top tattoo artists to see in Halifax by Narcity best of Halifax. Sin on Skin Tattoos is a long standing, AWARD winning, tattoo studio. We were recently listed as Best Tattoo Parlours to see in Canada by Flare Magazine. 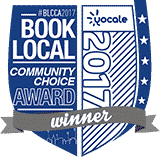 In 2017 we were given the "2017 Book Local Community Choice Award" from Yocale. 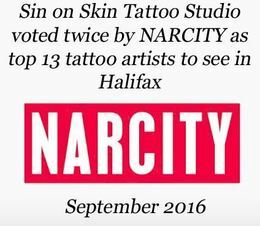 We've been rated as the top 3 tattoo studios to see in Halifax by "Three Best Rated" since Jan 2016. In December 2016/2017 we received their "AWARD of EXCELLENCE" Certificate. We also received the honor of being chosen twice for the "NARCITY" top 13 best tattoo artists you MUST Follow on INSTAGRAM 2016.
" This has been the standard since the very beginning." We ensure all clients receive a friendly, relaxed, professional experience, in a safe and sterile environment. Located in the heart of downtown Halifax, our studio is one of the longest running, top rated, and reviewed studios, that Halifax has to offer! Outstanding customer service and artwork will make this a tattoo experience to remember and keep you coming back for more. All artists in the studio have "Blood-borne Pathogen & HIV Certification" (Universal Precautions Training) and a full understanding of the necessary safeguards for cross contamination prevention. Keeping our clients happy, has been our secret to a long success in this industry. It's also allowed us to form strong connections to our clientele and their families over the years; giving them full trust in our abilities, cleanliness, and artwork. All tattoos are done by fully trained & experienced independent artists, producing top quality work. Most of our artist's now offer "Vegan-Friendly" and "Gluten Free" ink for our clients. We always strive to be the best on every level: artwork, equipment, ink, aftercare, and atmosphere. We want you to join our loyal clients who know amazing tattoos when they see them and know when dealing with us, they'll always get one. Over the years we have built an amazing clientele who have supported us by being our biggest fans and best advertisement. Our client's know when they leave here, they leave with a priceless piece of tattooed art that will last forever. Guaranteed! The studio has been in the downtown Halifax area since 1998; prior to Sin on Skin, we had been known as Skintastic Tattoo Studio. It was one of the oldest and the highest rated studios in Halifax. It was the first and only tattoo studio to ever be certified (inspected) as well as recommended by the Board of Health. At that time and in the present, we hold our standards higher; ensuring we provide a safe experience at the studio. We are also one of the few studios that have fully private and air conditioned tattoo rooms for our clients. We offer free consultations for all clients to go over your ideas or questions! We've built a strong connection & presence within our community; becoming involved with events, auctions, schools, government and local businesses. Our biggest event is our work with the local Sheriffs for "Justice Scores for Wishes" and "Pitches for Wishes". These events raise money for local "Make a Wish" children in need, held twice annually. We were also lucky enough to come on board when they did their "Justice for the Cure" (breast cancer) events, all together we helped these events to raise over $107,000.00 and sent many more children to live their dreams then we ever could have hoped for. Since 2011 we've been able to help struggling local families during the Christmas season. Whether it be from the loss of a job or loved one, illness, or just hard times, we let our families know that through our #HalifaxHasAHeart Christmas Campaign. By taking some of the stress of Christmas off their shoulders, it allows them to concentrate on what's most important for them. We take donations of food, money, gift cards, clothing, toys, as well as personal and household items. All items go to local families in need. We also put up a BIG thank you to all who help us each year on our social media and website.